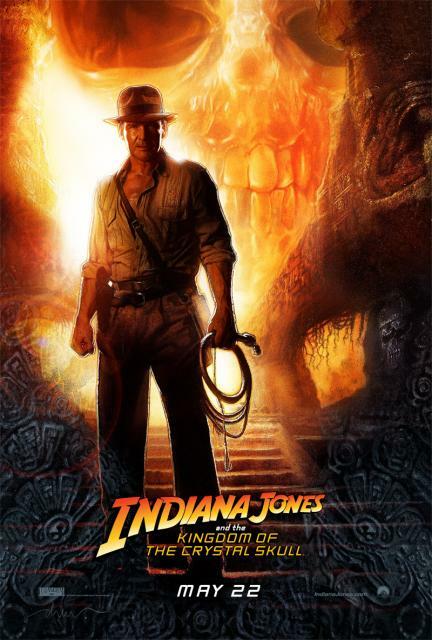 Indiana Jones – Spielbergs Sloppy Directing Was A Disappointment! I was really exciting to see the new Indiana Jones movie, but it wasn’t near what I expected. It wasn’t really bad or crap -no! But in comparison to the other Indiana Jones movies it was surely the worst. It won’t be a movie I will remember for a long time and neither will it make any movie history. It was just an average plain movie, not more and not less. I have to say, I have a special connection to the Indiana Jones movies. Because Indiana Jones and the last crusade was the first movie I’ve ever seen in a movie theater. I know, I was already 12 when I watched it, pretty late to be the first time in a movie theater. But in our small city wasn’t a movie theater yet. I can remember as it was yesterday, my brother gave me the tickets for my birthday and we drove to the next biggest city with my old buddy Eddy and watched the movie. It was a really great movie, great story, cool action, awesome actors and Harrison Ford on the peak of his career. I was still talking about the movie even weeks after I watched it. Even today I think it is a great movie. Harrison Ford is one of my favorite actors and he did his role as Indiana Jones pretty good, with humor, charme and his grumpy mood. I cannot imagine another actor is playing Indiana Jones except Harrison Ford. Even though Tom Selleck got offered the role first. So why do I think Indiana Jones and the Kingdom of Crystal Skull was a disappointment? First of all the cast, the son has nothing similar to Indiana Jones, he doesn’t look like him and he doesn’t have the same humor, charme and grumpy mood what makes Indiana Jones so great. The same with the other actors, Cate Blanchett can do better, this role wasn’t right for her to play just a stupid role as a Russian spy. She needs more insightful roles with character. The only actor I thought was good was John Hurt as professor Oxley. He didn’t say much but he played the crazy professor pretty good. All the other characters weren’t impressive at all. But what really annoyed me was the sloppy work of Steven Spielberg. Sometimes the skull was strong magnetic and sometimes not at all. They passed by the skull next to metal and nothing happened at all sometimes. Also the scene where they have a big truck to cut all trees and bushes to create a path through the jungle. After Indy destroyed the truck, they were still able to have a car chase in the middle of the jungle and suddenly there were even two paths available until the waterfall – come on! Some other scenes were also ridiculous, for example when Mutt was swinging like Tarzan through the jungle. What I also didn’t understand, why did Indy try to rescue Mac at the end of the movie, even though he tried to kill him and was working for the Russians. I was surprised anyway, that Mac was still alive after the big crash he had in the big ware house at the beginning of the movie. Where he crashed together with a truck. He wasn’t even hurt! The same miracle in the scene when they got thrown out by the water at the end, after 2 seconds, nobody was wet anymore at all. They were bone-dry. Of course, Indiana Jones is an action and fantasy movie, where 100 bullets won’t hit him, you can expect that, but a director like Steven Spielberg should pay more attention to the detail. How did you like the movie? Probably you think I am too critical, but you should expect little bit more from a crew like them. I just found an interesting website, where you can see all errors of many movies, here are some of Indiana Jones and the Kingdom of the Crystal Skull. I didn’t spot most of them and I’m normally not that critical but some errors where so obvious. I have heard a lot of people say this now, but I was so caught up in the story that I was ok with the flick. that’s exactly what I meant, it was an ok flick but nothing great, for an Indiana Jones movie IMHO not enough. That was a good analysis of the problems with the movie. After reading a couple of articles about Shia Labeuf I was primed to like him as “the next Tom Hanks” but not only did he not seem like the son of Indy, he doesn’t have much charisma. I had the good fortune of spending a year at Amblin Entertainment in the early 90s on a screenwriting fellowship. When I arrived, Spielberg was working on Jurassic Park, and their were life size rubber velocaraptors in the lobby of the main building. I glimpsed Steven in office watching over the shoulder of a CGI tech on a computer showing dinosaur footage, and saw the actors coming and going to the screening room over several weeks. He was also producing the TV show Sea Quest that year, and was in preproduction on many projects. What I realized was that some projects have his heart–or of any other busy director/producer, while other projects are on the B-list. sorry for the late reply, you are correct, Shia didn’t have much charisma, this is why he failed in this role. It’s pretty interesting that you got a chance to work at Amblin Entertainment. As you said, I think IJ 4 was just a money maker, but not a project Spielberg was really into it or a challenge for him anymore. I have yet to see this movie, which I was going to do very soon, but I don’t know if I want to now. I think I will anyway so I can look for some of the errors in the movie. Hi Mitch, you shoud watch the movie if you have the time and maybe you will even like it since you don’t have any expectation that this would be a must see and an awesome movie. Harrison Ford – one of my favorite actors – has a wonderful sense of character and depth and uniqueness to him, yet he’s able to just deliver the lines without putting any English on it.